In Amsterdam, during 1686, eighteen year old Nella Oortman travels from the country to the home of Johannes Brandt to take up the position of his wife. She arrives and is greeted not by Johannes but by his sister, Marin, who it appears will not easily be relinquishing the position of lady of the house. Also in residence are Cornelia, an outspoken maid, and Otto (Toot), a West African manservant. More family than mistress and servants, these three draw Nella into a whole new world. She dreams of love, but when she finally does meet Johannes she discovers that his affections are more of a filial nature. Bitterly disappointed, Nella despairs of her position in life. 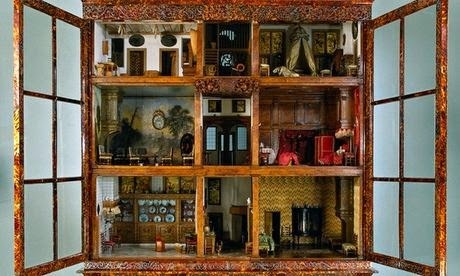 When Johannes gives her a belated wedding gift of a large, ornate miniature of their own house, Nella sets out to furnish it. If she can have no control over her real home, at least she will have this. But the mysterious Miniaturist that Nella hires to build her tiny furnishings has more on her agenda than simple service, and soon Nella sees the future predicted in the tiny parcels she is receiving. 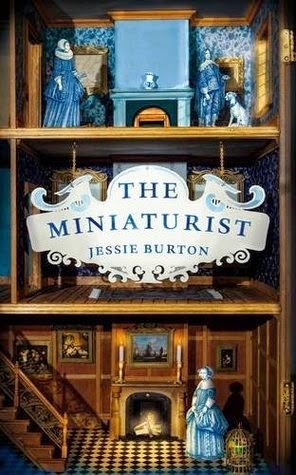 Who is the miniaturist? Can the events these terrible omens predict be stopped? On the front cover of this book, there is a quote from S.J. Watson which reads 'The kind of book that reminds you why you fell in love with reading.' I must agree wholeheartedly. The Miniaturist is the kind of book that keeps a reader up well past her usual sleep time, and compels her to read at every spare moment, including during quiet time at work. Burton creates a realistic Amsterdam, right down to the smell of herring and gingerbread. Reading this book is like travel. Nella Oortman is a lovable heroine; she does not feel sorry for herself despite experiencing loneliness, rejection and ostracism in her new world. As readers, we see Nella grow from the naive country girl she begins as, to a strong and loyal woman who is determined and overcomes disappointment to help her family (even when sometimes they don't deserve it.) Through Nella, beauty and softness are introduced into the very masculine world of the Brandt household, where Johannes is the master and his sister Marin is more his unwanted prodigy than demure lady. Unlikely as it seems as first, these three people learn to rely on one another, and the writing of this burgeoning relationship is done with great subtlety and insight into the human psyche. The Amsterdam of 1686 is a place where 'The Guilder is King' and the burgomasters place strict rules on the trade practices of inhabitants. As a trader for the VOC (The Dutch East-India Company), Johannes Brandt has made a lot of money for Amsterdammers. But the country is also extremely religious. Bans are made on false idols and so gingerbread men, and Nella's miniatures, become dangerous. And when Johannes is accused of being a sodomite, his fate looks to be drowning in the harbour with a millstone around his neck. The tension in this novel builds beautifully, with many moments of shock appearing with spine-tingling accuracy. It is a novel that had the ability to surprise me, a rare feat seeing as studying creative writing appears to have given me the superpower of recognising planted objects in plot which give away the endings. In many ways, this novel was as thrilling and suspenseful as a Wilkie Collins novel. I want to read this novel again and again and again. Its themes are multitude, I can't have picked up on them all. It is primarily a novel with a very feminist message, about the reality of a woman's place in such a society. All women, not just Nella Oortman, are miniaturists in their ability to run their tiny kingdoms of the home, since they are excluded from the world at large...which Nella and Marin prove in this novel that they are more than capable of existing in. Five stars. I am breathless. I am glad you loved this, I pushed myself as far as Part 2 and then gave up. Just didn't work for me sadly. Hi Shelleyrae, thanks for your input! I saw on Goodreads that you hadn't finished it, and I was really interested by that. I couldn't have done it, I had too many questions, and I am now seriously considering saving for a trip to Amsterdam.